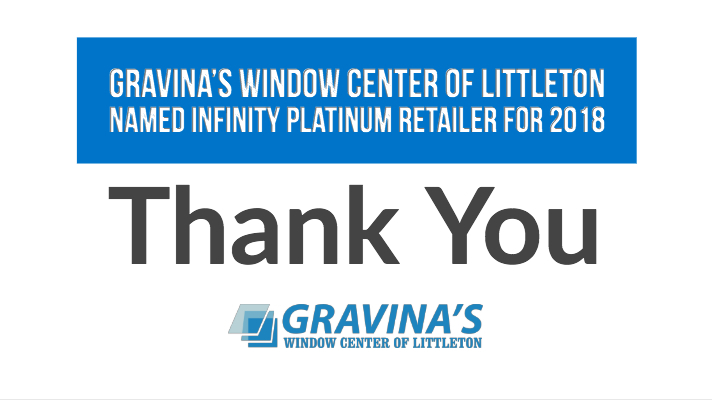 Gravina's Window Center of Littleton has earned the distinction of being named an Infinity Platinum Retailer for 2018! Infinity’s Platinum Retailer Program has once again rewarded Gravina's Window Center of Littleton, who makes Infinity Windows their brand of choice. Infinity recognizes Gravina's Window Center of Littleton's commitment to successfully representing the Infinity from Marvin brand in the Colorado window replacement market by implementing industry best practices in key functional business areas, including sales, marketing, operations, leadership, and credit. Infinity from Marvin is a family-owned company as are many of its Infinity installing retailers, including Gravina's Window Center of Littleton. Both Gravina's Window Center of Littleton and Infinity share many of the same values: caring, trust, high standards, customer satisfaction, creativity, and service. Customers trust the Infinity and Gravina's Window Center of Littleton names because it means a quality product backed by service. The end result of this partnership is a total window experience for our customers.